"One Miraculous Performance After Another." 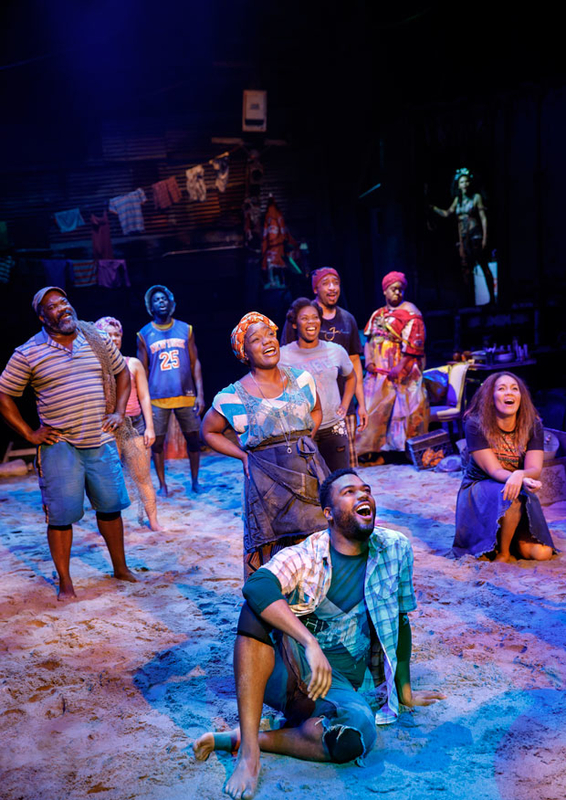 Once On This Island is a special theatrical experience in so many ways. If I had the opportunity, I’d talk to you for hours, ruminating on all of the incredible pieces of the show and how they all work so well together. How it creates one of those magical nights when you leave wishing you could live in that world a little bit longer. But for the sake of brevity, I’ll just hit a few highlights. The feeling of the space upon entering the Circle In The Square Theater immediately takes you away from the busy bustling streets of NYC to a much slower tempo, and a much sunnier sandier place. Suddenly you’re on an island where the island dwellers are already actively moving about, bare feet in the sand (which takes up the entirety of the stage itself) commiserating and going about their business (some of which involves a live chicken and a live goat). The actors are living in their characters before the show even begins, and the audience is already in the process of tuning in, which leads seamlessly into the main event. I must say, as an actor, I love watching moments like these, truthful moments between characters that come right out of the actor’s imagination. They’re not only a great way to pull the audience in gradually, but I think it helps to have that time as an actor to explore the space as well. Theater MAGIC! And speaking of actors, these are some of the best actors with the best pipes on Broadway. The star of the show, Hailey Kilgore, is a revelation in her breakout performance as Ti Moune, but the talent doesn’t stop there. Every new song shows off one incredible voice and one miraculous performance after another. And one of the luxuries of seeing a show in the round is that at any given point you’re much closer to one actor than you are to any of the others, which gives you a chance to watch and listen very closely to individual voices within the ensemble. This particular ensemble is alive with very specific and vibrant characters, all of whom sing the roof off the building. I had a field day after the show looking each of them up online, sifting through one YouTube video after another, marveling at all the talent packed into that cast. There is so much to love about this show; the wonderful performances, the inventiveness of the direction and the cleverness of the lighting and costumes, the chicken and the goat. I could truly go on and on, but I won’t. Suffice it to say, in my opinion, it’s worth far more than the price of admission. Take 90 (intermission-less) minutes to see this beautiful show. You won’t regret it. Will Burton is a Broadway performer, currently playing Ambrose Kemper in the revival of Hello, Dolly! "I Hope I Can Convey My Gratitude."